Cut the chicken fillets in half horizontally. Drizzle with olive oil and season well with salt and freshly ground black pepper. Heat a pan over high heat and fry the chicken for 2 minutes per side, or until just done. Cover in foil for a few minutes until ready to serve. Toss together the tomatoes, olives, herbs, olive oil and vinegar. 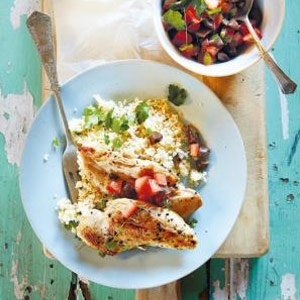 Serve with the chicken on a bed of couscous or creamy polenta. Text and image source: Ideas magazine.